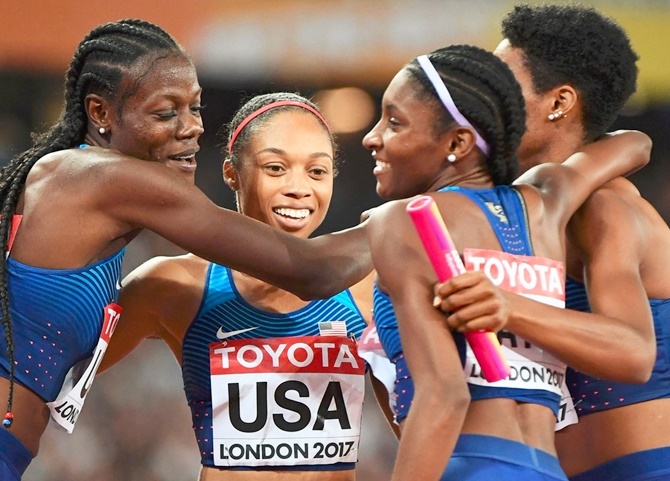 Olympic champions the United States reclaimed their women’s 4x400m relay world title as Jamaica suffered more injury heartbreak in the World Championships final on Sunday. Twenty four hours after Usain Bolt sensationally pulled up in his relay event, Anneisha McLaughlin-Whilby slowed down clutching her leg 20 metres into her second leg and went to ground, ending Jamaica’s reign as world champions. Jamaica had been in the lead, but American Allyson Felix surged clear of the field to open up a 15-metre gap in a superb split of 48.7 seconds. Team mates Shakima Wimbley and individual 400m champion Phyllis Francis duly extended the gap to win gold in a world leading time of 3 minutes 19.02 seconds. Felix enhanced her record as the most decorated athlete in World Championships history by winning her 11th gold to equal Bolt's haul. It was her 16th medal overall. "It does mean so much to me every time," Felix said. "I'm grateful to run with these amazing girls. They work so hard and deserve all their success. It's an honour to run in the relay for Team USA and I will always treasure these moments." The 60,000 spectators inside the London Stadium were on their feet as Britain finished second in 3:25.00 to clinch silver, an upgrade from their bronze at the Olympics last year. Poland came third in 3:25.41 to claim bronze. McLaughlin-Whilby had to be taken off the track in a wheelchair and her withdrawal meant there was no farewell run for Novlene Williams-Mills. The 35-year-old, who made her debut in this event at the 2004 Olympics in Athens where Jamaica won bronze, overcame breast cancer in 2013 and won six World Championship medals overall. Williams-Mills was due to take the baton from McLaughlin-Whilby for her final run but was left stranded on the start/finish line due to her team mate's misfortune. Caster Semenya claimed another global title when she won the world 800 metres gold on Sunday and after surging clear to record one minute 55.16 seconds she said she now has an eye on the world record. Francine Niyonsaba of Burundi, who took silver behind her in Rio, was second again in 1:55.92 with American's Ajee Wilson claiming bronze in 1:56.65. South Africa's Semenya, who won bronze in the unfamiliar 1,500m on Monday, looked much more at home in her preferred event. Niyonsaba led the field round at a sharp pace, hitting the bell at 57.98 seconds, with Wilson, who set a U.S. record this year, hot on her heels. 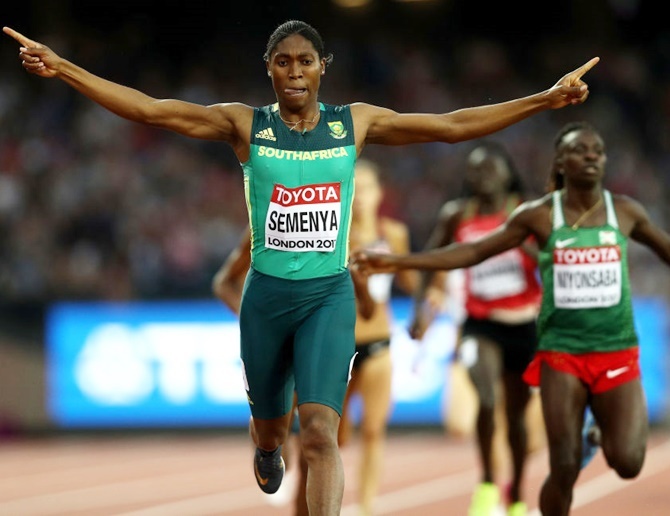 Semenya, however, maintained her languid stride a few metres back before closing the gap, easing past both on the final bend and running clear. 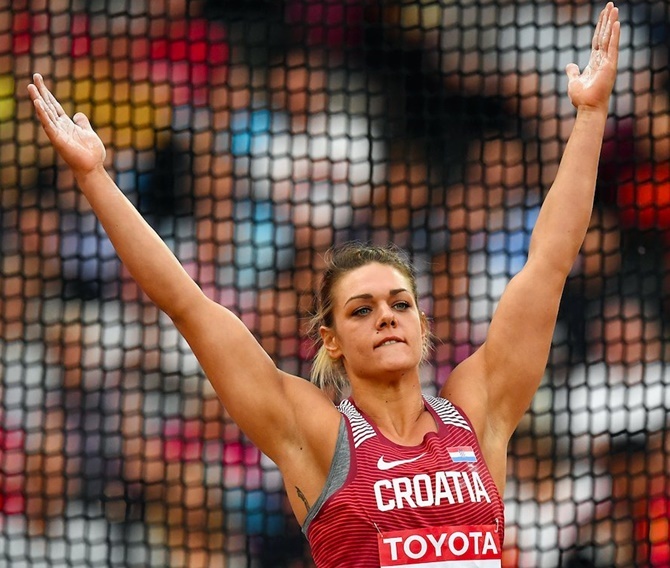 Double Olympic champion Sandra Perkovic eased her way to a second world discus title after being the only athlete to throw over 70 metres at the World Championships on Sunday. The Croatian, who first won the world title in 2013, threw 70.31 on her second attempt which was enough to triumph in the same stadium in which she won Olympic gold in 2012. The 27-year-old had the top three throws of 2017 going into the competition, and led from the first attempt in the final to secure her country’s first gold of the championships. "I really enjoyed this competition like I never did before," she told reporters. "I am happy to get my world title back. "My goal today was to throw over 70 metres because that I was sure that would be a medal mark." Perkovic’s romp to gold was only seriously threatened on the final attempt by Dani Stevens of Australia. The 29-year-old was concentrating intensely as she strode into the throwing circle and launched the discus one last time for glory. It resulted in a personal best 69.64 metres which was enough for silver, her first World Championship medal since she won the title in 2009. "I am in utopia right now," Stevens said. "I am so excited. Everything came together at the right moment. I cannot believe it. I did not think that I could throw that far." 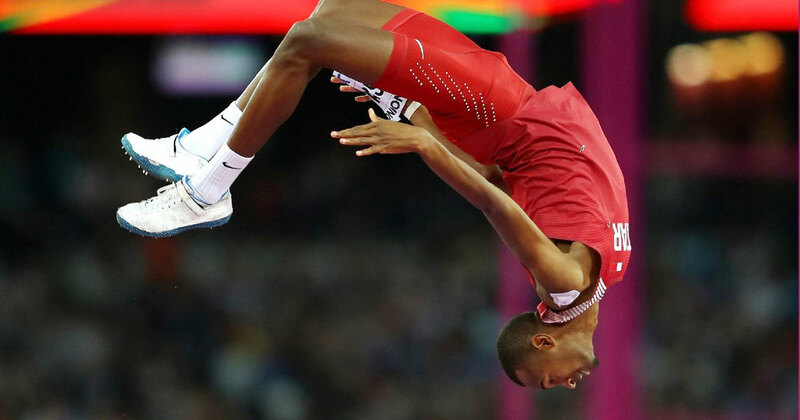 Qatar's Mutaz Essa Barshim secured the global high jump title his talent has promised for so long when he completed a faultless series in the World Championships on Sunday, culminating in a winning leap of 2.35 metres. The Qatari, whose 2.43m best is the second-highest in history after Cuban Javier Sotomayor's 2.45 set 24 years ago, has won silver and bronze at the last two Olympics and silver in the 2013 World Championships. But he was a class apart on Sunday, having qualified without a fail he went through the final never looking remotely close to dislodging the bar as he flexed his body into biology-defying shapes. With the gold secured he went agonisingly close to clearing 2.40 but there was no disappointment and the 26-year-old can target a crack at the world record on home soil when Doha hosts the next World Championships in 2019. Russian Danil Lysenko, competing as a neutral athlete, took silver with 2.32m while Majd Eddin Ghazal of Syria had the best record of three men who cleared 2.29 to take bronze - his country's first world championship medal for a man. Kenyan Hellen Obiri produced an astonishing last lap to leave defending champion Almaz Ayana in her wake as she won the women's 5,000 metres at the World Athletics Championships and claimed her first major title on Sunday. 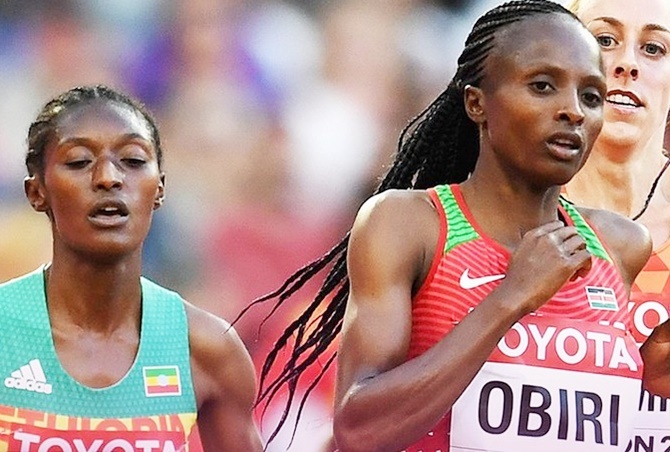 Ethiopia's Ayana, who led Obiri for more than half the race, was denied a double after winning the 10,000 metres with a devastating run earlier at the championships. The pair broke clear of the pack after one third of the race and opened up a huge gap as they set a blistering pace. Ayana led with Obiri on her shoulder into the final lap until the Kenyan, silver medallist in Rio de Janeiro last year, burst past with 300 metres left and stormed home to win in 14:34.86, more than five seconds clear of her rival. Sifan Hassan of the Netherlands prevented an East African clean sweep by taking the bronze. "I was telling myself to go. I could see Ayana was not going so I thought, why not?" said Obiri. "I am mentally strong so I knew I was capable." It was always going to be an enthralling contest. Obiri, 27, has steadily moved closer to a major title over the course of he career and had won all of her races this summer over 5,000 metres, clocking the fastest time of the year when she ran 14:18.37 in Rome. Ayana was bronze medallist over the distance in Rio where she also won the 10,000 metres and set a world record. She has been plagued by injury this season and the 10,000 race on Aug.5 was her first of the season. Obiri did not run the 10,000 metres last week and her decision to concentrate on the shorter distance paid off. There was a cagey start with the first 400 metres taking a painfully slow 81 seconds before Ayana and Obiri took control. Ayana seized the initiative with nine laps left, Obiri followed and after steadily increasing the gap, they were more than 50 metres clear with four to go. The Ethiopian tried several times to pull away but Obiri responded each time before producing her deadly final push. "It was a difficult race. I am better at leading it to get the win rather than challenging in a final sprint. It was difficult to push Hellen through to the finish line," said Ayana. "Compared to Rio this is a bigger achievement. I've had many injuries this year so I am very happy with two medals." Trinidad and Tobago denied United States a seventh successive world 4x400 metres relay title when Lalonde Gordon overhauled Fred Kerley on the final straight to win a breathtaking final at the World Athletics Championships on Sunday. The U.S led for most of the race and appeared to be on course for another win after Michael Cherry ran a strong third lap to extend their lead before handing the baton to Kerley. But Gordon gave chase and ran a superb final lap for the Caribbean islands, catching the American on the home straight to give Trinidad their first world title in this event and add to the list of upsets at the championships. It was just reward for Lalonde who was part of the Trinidad team which took bronze on the same track at the London Olympics five years ago and won silver at the Beijing World Championships in 2015. 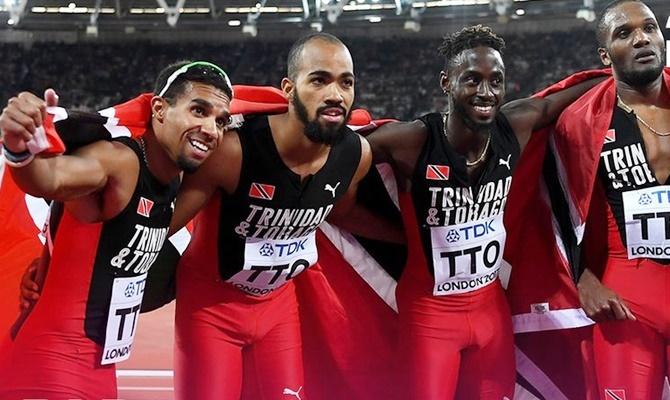 Jereem Richards, bronze medallist in the 200 metres, and Machel Cedenio also kept them in contention in the second and third legs as Trinidad claimed their first and only gold of the championships. Martyn Rooney put up a brave chase for Britain but was unable to haul in the leading pair and the hosts took bronze. Trinidad's time of 2:58.12 was the fastest this year. "We knew the U.S. team are always strong and we were prepared for that," Cedenio said. "I think it was the best experience of all my career....We came third in 2012 in the national record. Now it is gold and I cannot ask for more." Jamaica and Bahamas, Olympic silver and bronze medallists respectively in Rio de Janeiro last year, both failed to qualify for the final as did Botswana, another of the favourites, after they dropped the baton in the semi-finals. Asbel Kiprop failed in his bid for a fourth consecutive 1,500 metres gold medal at the World Championships on Sunday - but Kenya still celebrated a dazzling one-two with new champion Elijah Manangoi leading home his friend Timothy Cheruiyot. Manangoi, the fastest man in the world this year, sped past his young training partner on the home straight of the last individual track event to take the title in 3 minutes 33.61 seconds, just ahead of Cheruiyot (3:33.99). Kiprop, who had briefly threatened to make it a Kenyan clean sweep, found the pace too hot on the last lap, fading into ninth place in 3:37.24. It was a fairly tame attempt to emulate the four straight metric mile world golds of Moroccan Hicham El Guerrouj from the enigmatic 28-year-old Kiprop, who had one of his off-days. Norway's European champion Filip Ingebrigtsen snatched the bronze, throwing himself across the line to just oust Spain's Adel Mechaal for the medal by 0.18 seconds in 3:34.53.